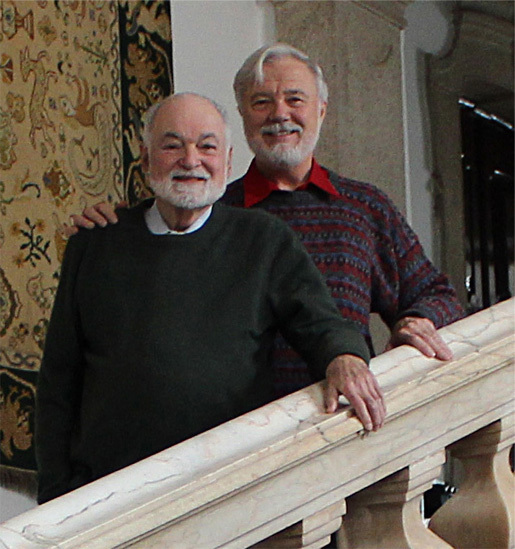 Here we are, Leo and Iory, the two happy husbands in Evora, Portugal, on the main stairs of our hotel, Pousada dos Lóios. To celebrate Leo’s eightieth birthday which was November 27, 2013 we flew to Portugal for the first two weeks of December. We decided that we would go to Lisbon and then on to Evora, a provincial walled city about two hours journey inland from the capital. We wanted to take our time and leisurely explore these two places and also have the luxury of doing unimportant things such as siting in cafés and watching the city on parade. Leo had been to Portugal numerous times during his tour of duty in the army back in the late 50’s. He had studied Portuguese at the Army Language School in Monterey, California but was posted to Kitzingen, Germany for his service with Army intelligence. 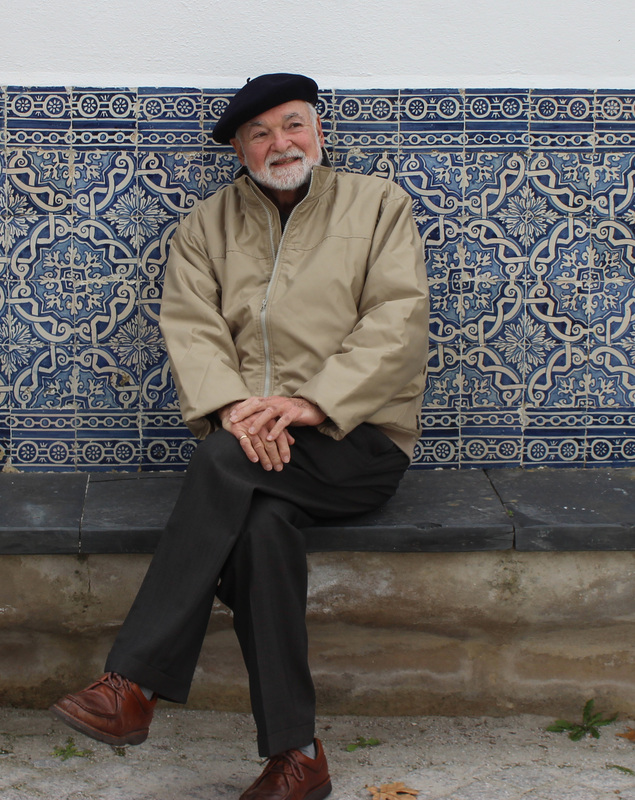 During his leisure time he naturally travelled to Portugal, fell in love with the place and has returned a number of times over the years but not recently. Although I had never been to Portugal, when I was a boy around eight years old I had a friend, Miss Gibbons, who lived next door to us in New Canaan, Connecticut. She was an elderly genteel lady who traveled to Europe annually on the elegant Cunard ships. When she was home I would visit her magical apartment where she taught me to play mah jong with an ivory and lacquer game set that one of her Baltimore ancestors had “brought back around the Horn from china in the early nineteenth century.” I was fascinated by Miss Gibbons and never stopped asking her about travels and all the beautiful art and antiques in her spacious apartment. She told me of all of her adventures abroad putting special emphasis on how much she enjoyed Portugal especially Lisbon. So naturally I was eager to go. 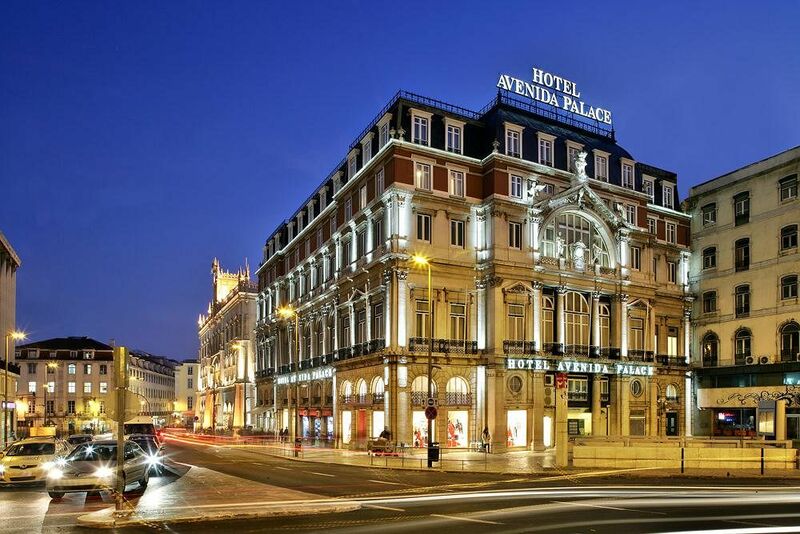 For the triumphant occasion of Don Leopoldo achieving the rank of Magnificent Venerable and beginning his 80th year we pulled out all the stops and booked a suite at the Hotel Avenida Palace in Lisbon. As you can see this impressive hostelry fairly sparkles while enjoying pride of place lodged between two grand squares, Parça Dos Restauadores and Praça Dom Pedro IV, in the Baixa district at the center of the city. 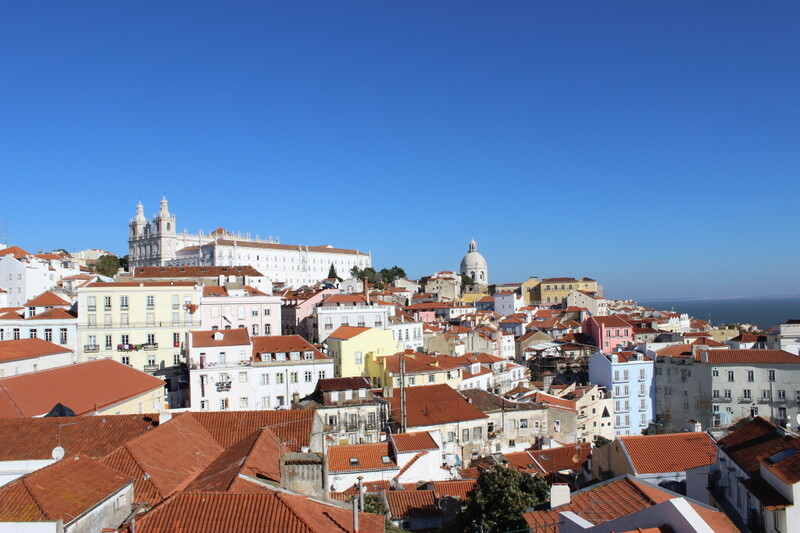 Lisbon is a city built on steep hills creating different neighborhoods and districts. As we walked around we were delighted by changing picturesque views that would unfold, revealing a fresh angle of landmarks we were beginning to recognize. The River Tagus is very broad, more like an enormous bay rather than a river. The ever present sparkling bright sunlight bounces off the dark turbulent water. Thin veils of mist sometimes subdue the brilliance, but during our stay in Lisbon the air was clear and the atmosphere was effervescent with the temperatures around high forties and mid-fifties making for perfect touring weather. We arrived early morning about 8:AM and were already at our hotel before long. Because of our all-night flight we knew we would be a bit weary so after checking into the Avenida Palace we headed out to take the tour bus around town to get oriented and not exhaust ourselves. It turned out that that if you bought the tour package you could ride several kinds of “on and off” transit from double decker busses with open second levels or small electric trollies much like the cable cars of San Francisco and even a round trip on the famous Elevador de Santa Justa disguised as a gothic tower and built by Raul Mesnier a pupil of Eiffel. This truly eccentric lift takes you up 147 feet to viewing platforms where a huge swath of the city is revealed with a broad expanse of the Tagus shining brightly in the distance. My astrological sign is Aries so I identify with the mountain ram that climbs to the top of peaks to gaze down and watch from a safe place. Lisbon is full of “Miradouros” or public terraced viewpoints furnished with benches, perhaps a trickling fountain, shade trees and / or the ubiquitous kiosk cafe serving coffee, drinks and light snacks . From these comfortable perches one can survey the city spread out below. I have prepared a picture essay of Lisbon on Flickr with captions that I tried to keep brief. This essay can be viewed all at once by scrolling down the display page and thereby seeing the whole sweep of my offerings. If you click on any one of the pictures it will open in a larger version where you will see the caption. In this mode you can page through the pictures by clicking the > forward or < backward arrows that appear on either side of the picture. Please know that all my photos are in sharp focus, if the picture you have clicked on is not immediately clear just wait 20 seconds or so and it will shine forth in all its glory. If you wish to return, at any time, to the picture-only display page, please click the white X icon on the upper right corner of the Flickr page below the words “Sign In”. 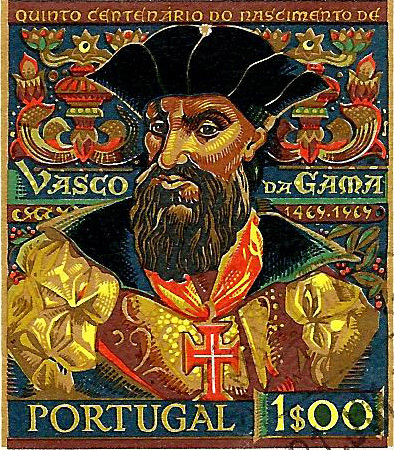 So if you are ready to fly my magic carpet to Lisbon, click the Vasco da Gama postal stamp below. This entry was posted in Portugal, World Travel on February 16, 2014 by ioryallison3.